One of the most confusing things we can do to our pets (or even people in our own lives – especially young children) is provide a lack of consistency. Why? Because consistency in training will make a behaviour more reliable. How? Our pets are very good at predicting the future based on the past, this in itself is one of the reasons that they are so easy to train. Providing consistency will mean that your pet is able to reliably predict the outcome of behaviour. So what do you need to consider when thinking about CONSISTENCY? It is important to say the cue only the once. Sit means Sit, not Sit Sit Siiiittt means Sit. If the animal does not respond – use a lure or target. If the animal still does not respond – consider do they really know what the cue means (and have your generalized it)? Make sure the cue is only used for one behaviour. Therefore DROP means either drop the ball or lie down – but not both, DOWN means either hop down or lie down – but not both. Is everyone on the same page with the chosen cue word? When learning new behaviours have family meetings to decide on cue words and display them somewhere so everyone can remember (fridge works well). Watch your body cues – make sure they are consistent and be wary that our critters can pick up on subtleties that even we may not be aware of. Such as a hand signal for a drop, and inadvertently taking a step back at the same time…which part is the cue for the dog? What is Syntax? It is the arrangement of the words/phrases used in our language. How could this be a problem? Consider what you say when talking to your pet. Consider the following examples of words/phrases that to you may mean the same thing but to your pet, they will not. Do you remember as a child how confusing it was when one caregiver said one thing and another said something different? This is just as confusing for the pets. Is the dog allowed to jump on you? Its ok, I understand that this is an awesome greeting and that many of us enjoy these moments with our dogs. However, consider this. Yes, you may like your dog jumping on you, but what if they have muddy paws…would it make you mad? Remember it is not the dogs fault if you haven’t been clear in your expectations. How can you manage these situations? Put the behaviour on cue. That way the dog doesn’t jump on everyone and you can be selective when you request the jump and avoid the muddy paws. So you want a guard dog, but you don’t want them to bark when the TV is on or it is after 10pm? Is this really fair or clear to the dog? Teach them a 3 bark rule, and reward them for warranted short barks, redirect to desired behaviour that you can reward when you don’t want them to bark (go to bed/mat/crate). Minimize access to front yard and postman chasing etc. Have a sign at your gate/front door requesting persons to phone or text instead of knock or ring. Again, I don’t have a problem with pets having access to your bed or couch providing they do not guard them from you. However it is unreasonable to expect your pet to know that they are allowed on the couch when Dad is home, but when Mum gets home it’s a no no. Or they are allowed to sleep with you at night, but not allowed on the bed during the day when you aren’t home. So make a rule, yes or no, and stick to it. If you don’t want your pet on the bed when you are not there, yet they are allowed at other times it is quite a simple answer - don’t give them access to the room. Remember our critters like comfort, and if you do not provide them an equally comfortable bed of their own, it is only natural that they will seek a more comfortable area out. They are not dominating you when they do this. This is a huge one. So often our dogs are allowed to pull, and then suddenly not – you get strict for a few minutes, days or even weeks, however – it gets too hard or the dog seems to “get it” and then you don’t provide consistency and they are allowed to pull again and are rewarded by moving forward to the tree, getting to the dog park faster, snatching the McDonalds pack from the ground. If you wish your dog to pull, and some do, as it can be helpful for strengthening etc, consider using a different piece of walking equipment, or different attachment point that indicates “yes you may pull”, or “no, now we are walking politely”. Good harnesses that you can do this with include the Ruff Wear Front Range or Freedom Harness – both of these harnesses have rear and front points of attachment. Rear attachment can be “yes you may pull”, where front is “now we are walking nicely”. However, for this to work, remember, you need to be CONSISTENT. Any time your dog moves forward while pulling, the dog has been reward for the pulling behaviour. Again, sharing your food with your pets is not necessarily bad, as long as in moderation, safe for them to eat and with rules. However, if you choose to share your food with your pets, do not get frustrated with them when they hear you make a sandwich and sit at your feet drooling or start pawing/clawing at you. This is something that can drive some people batty, so have a family discussion and make a clear rule about sharing your food with your critters. If you do choose to share food, especially when at the dinner table etc, train your pet to sit on a mat or go to crate or station area so that they are not annoying or demanding it from you. Instead it is the patient, quiet behaviour that earns the reward. One thing that many people over look is that our pets often do not generalise a behaviour as we do. When a behaviour has been generalised it will mean the same thing to the pet regardless of location/scenario. However when this hasn’t happened it is very confusing for our pets, and frustrating for you. So an example: Until SIT means SIT in the house, the front yard, the back yard, the street, the park, the vet clinic etc…. your dog has not generalised the behaviour. This is why one of the most common phrases I hear in a dog training class, is “but he knows it at home”. And I believe you he does, however, as the pet’s carer you need to take the time to retrain or reduce expectations for this behaviour in different locations, scenarios or contexts. When beginning to generalize the behaviour, practice in a place where the animal has succeeded first and then move to a new location/scenario while it is still fresh in his/her mind. Decrease your criteria and increase your rate or reinforcement and the reward quality. In summary, inconsistency is confusing for your pets. Imagine life from their point of view, where at times they are rewarded for a behaviour and then at others they are punished for the exact same thing. 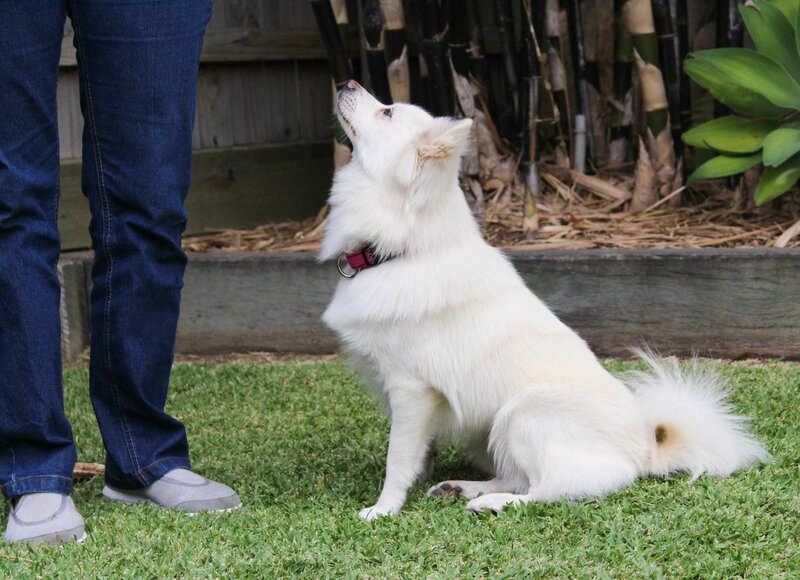 Be consistent with your pets training, and you will find that the training process is much smoother and will also result in a much more reliable behaviour.